A lot of my work comes from my interest in mythology. The stories humans have told for centuries. The ability for us as a species to create these stories. I take inspiration from all kinds of sources. For this body of work I wanted to make my own depictions of classical characters and myths. I started by writing down any particular gods and characters that I remembered from classics, folklore and popular culture. Something else that was important to me was that I wanted the images to be organic and unedited; I wanted these characters to exist in the real world. Being able to do this was part of the challenge of creating a believable fiction. To create images that cannot be tampered with, I opted to shoot the whole series on Polaroid 600 film. Basic and idiot-proof controls strip back any of the complexities of shooting an otherwise “high quality” image. This lack of control allows me to focus solely on the composition as well as the construction of the reality in front of the lens. I wanted to make each image speak for the character it represented in a more modern setting. Ophelia is floating on the water (top middle). Zeus is surrounded by electrical cables (top right). After some experimentation, I made composites of the digital files shot as a backup. They look nice in regards to the resolution and impact, but I feel like they really lost their atmosphere and mood. Making the images so clear really lost the mystery and feeling of the Polaroids. 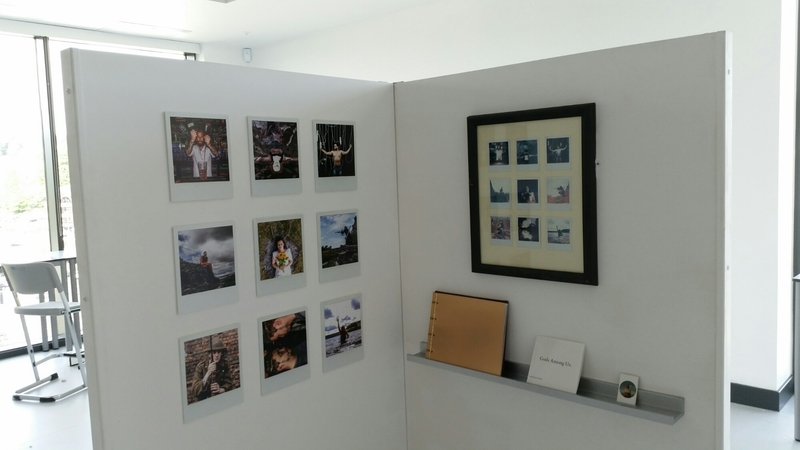 These images were featured in an exhibition in The College, Merthyr Tydfil. I got a generous amount of space to work with so I displayed both sets of images alongside a copy of the images in a book. I mounted both sets of images in the same 3×3 grid order. The original Polaroids are mounted on cream mount board, in a black frame. The digital images were printed out onto a semi gloss paper and mounted onto foam board to make for a lightweight, large scale display.